Seems like the month of May is going to be full of thoughts about brothers. I didn’t get a chance to post when it happened, but I became an Uncle this month – if you can believe that. OK, first some background. I am the only child of Quinton Worthams and Ernesta Whitlock. My parents were married for about five years or so and shortly after I was born in ’74, they divorced. Mom brought me back from L.A. to live with my Grandma and Grandpa in Kalamazoo. Dad stayed out there where he re-married and had three children with Cristina Worthams. My half-siblings are (in order of age), Quinton Jr, Robert, and Jennifer. We lost Jennifer in a tragic car accident in Atlanta last October and Dad asked me to attend both the services in Atlanta and in L.A. During that time, I got to know my little brother and realized that we have a pretty big bond. Robert lives in the Washington, DC area and I hope that when I go on lobbying trips to DC, I’ll be able to catch up with him and his wife Nailah. At any rate, back to the story – I’m an uncle. Robert Jr was born on April 28th around 7:20 in evening. He is 8 lbs, 2 oz and I’m sure he’ll be like his dad and will be growing like weed. Well, here’s to those of us who love our brothers … especially the ones that we have had a second chance to get to know again. 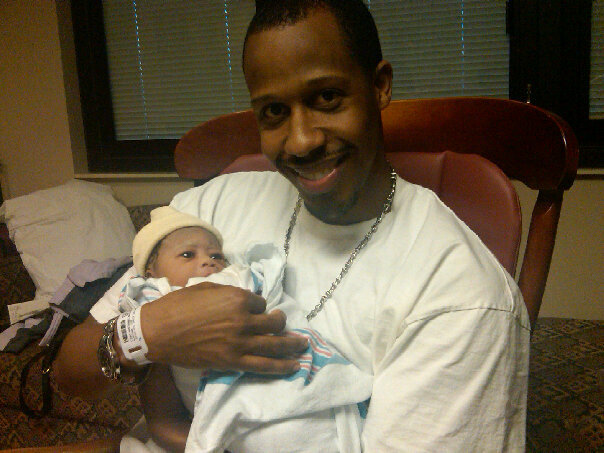 Congrats RDW and Ms. Naliah – and welcome to the Big Blue Marble, Mr. Robert, Jr! Good stuff Dave, thanks for sharing.